Harebell flowers can be found in nutrient-poor grasslands. They can survive in the cracks of pavement, along the sides of rock cliffs, and in sand dune – they are hardy plants! Most flowers are blue-violet, pink or white in color. 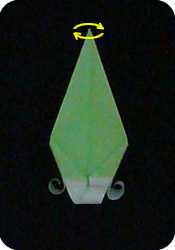 The flowers have 5 fused petals which form a bell shape. 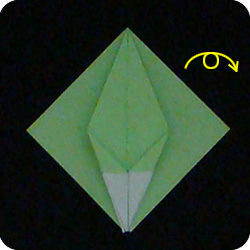 The origami flower shown here has 4 petals and it is green! 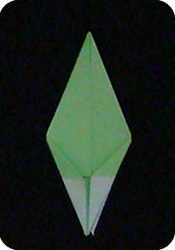 Clearly this is a stylized version of the true harebells found in nature. 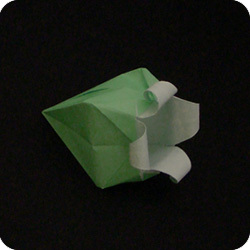 However, the great part of this paper flower is that it’s super easy to make. Despite the ease of construction, it is very beautiful and can capture a lady’s heart. 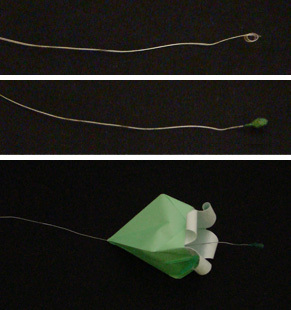 Learn how to put the harebell on a thin stem here. 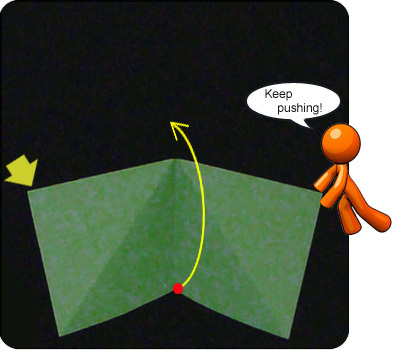 Turn the paper over. Fold the paper in half (left to right). Unfold. 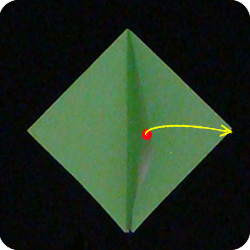 Gently push the top-left and top-right corners of the paper as you lift the front section (red dot). 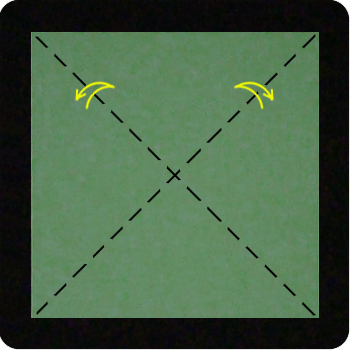 You should have square that is a quarter the size of the original paper. 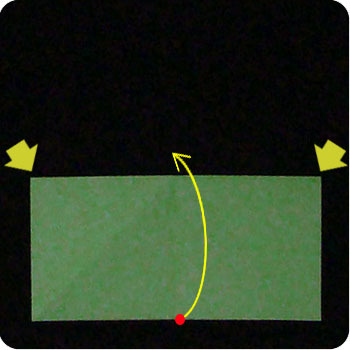 This is a special intermediate stage called a Preliminary Base. Working with the top layers only, fold the top-left and top-right edges of the paper towards the central midline. 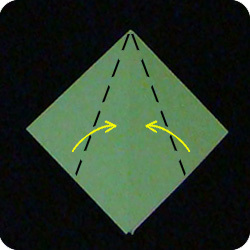 Fold the bottom-left and bottom-right edges of the paper towards the central midline. 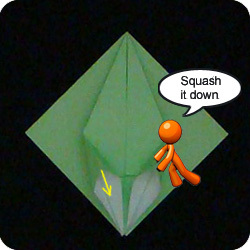 You will now do the Squash Fold. 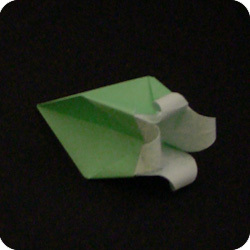 First, unfold the previous step slightly. 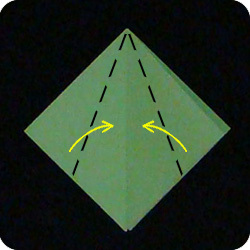 Peel apart the two layers of paper (arrow shown on one side, but perform squash fold on both sides). 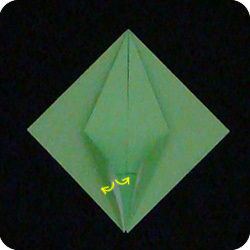 Squash down the paper so it lies flat. 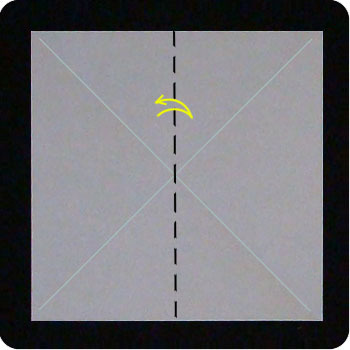 Align the crease mark with the edges of the paper so you can squash the paper evenly. 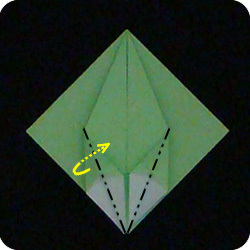 Fold back (mountain fold) the paper so it tucks behind the model (see next photo). 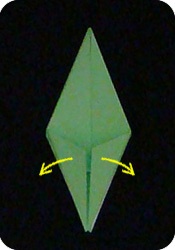 Turn the model over and repeat steps 5, 6, 7, and 8. 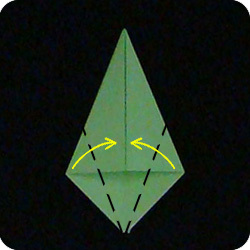 Fold the top-left and top-right edges of the model towards the central midline. 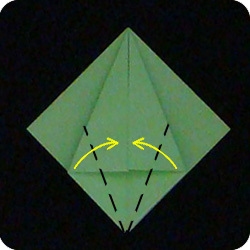 Fold the bottom-left and bottom-right edges to the central midline. Peel open layers and squash down. 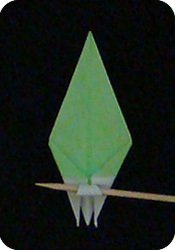 Roll the tips of the flower around a pencil or a wooden skewer . 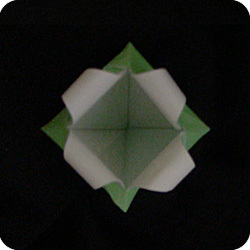 Do this for all 4 petals. 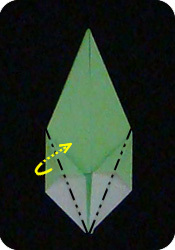 Spread apart the 4 edges of the model so the flower becomes 3D. 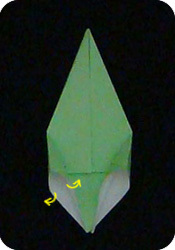 Use your finger to pop open the flower so it has more volume. 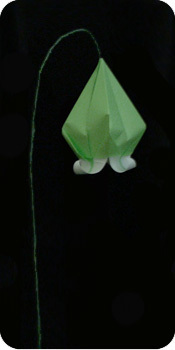 – mold the stem so the flower hangs down. 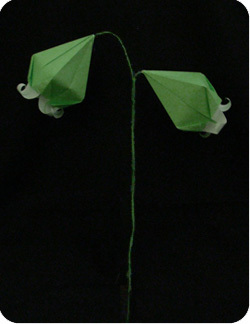 You can also add more origami harebell flowers on the same stem to get a delightful cluster of flowers.